The very talented and the award winning Bollywood actress, Vidya Balan’s upcoming movie, Tumhari Sulu is out with its first teaser poster. Though the first movie poster of Tumhari Sulu doesn’t showcase Begum Jaan starrer, Vidya Balan in a glamorous look, still the first look of the poster looks amazing Vidya Balan hidden behind the heaps of home appliances boxes. Tumhari Sulu is one of the most awaited Bollywood films of 2017 that is now ready to hit the theatres. This Vidya Balan starrer Tumhari Sulu is a Rom-Com drama film that unfolds the multi facet actress’s flip side of the personality and acting skills. Tumhari Sulu is a Hindi upcoming movie where Vidya Balan, plays a housewife named Sulochana alias Sulu, who is beautiful, happy and a go getter but her life takes a U-turn when she gets an unexpected opportunity of being a night radio jockey at Mumbai’s one of the renowned radio channel. Neha Dhupia plays Vidya Balan’s boss at the radio station while Manav Kaul plays Vidya Balan’s husband. The movie Tumhari Sulu also features the very famous RJ, Malishka who plays Albeli Anjali. Here is the glipmse of the of Vidya Balan’s upcoming Hindi Bollywood movie poster, Tumhari Sulu. As per the poster, the first look of the movie Tumhari Sulu will be aired on September 14 while movie will be released on December 1, 2017. 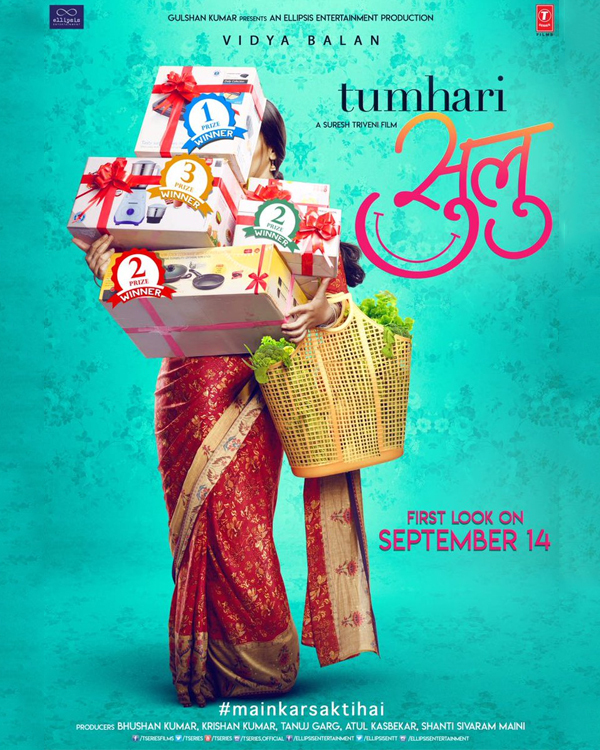 Tumhari Sulu movie is directed by Suresh Triveni and is jointly produced by Tanuj Garg, Bhushan Kumar, Shanti Sivaram Maini and Atul Kasbekar under T-Series and Ellipsis Entertainment banners. The Bollywood’s upcoming movie Tumhari Sulu is set to release on December 1, 2017 that has renowned artists including Vidya Balan, Neha Dhupia, Malishka Mendonsa, Vijay Maurya, Manav Kaul, Sindhu Shekharan, Abhishek Sharma, Trupti Khamkar, Seema Taneja, Uday Lagoo and Shantanu Ghatak. 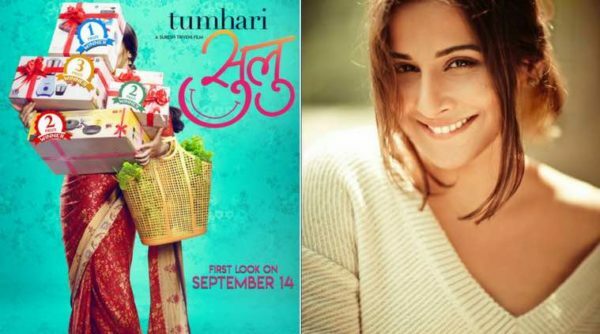 Well, withe poster released, the Indian movie buffs as well as the Vidya Balan fans will eagerly wait to watch this movie Tumhari Sulu on December 1. Till then, we can wait for the movie trailer or the second look of Tumahri Sulu, with probably Vidya Balan’s face in it, to come out.